Blogging is a never-ending job of providing new, relevant content to your readers. The problem is, all that great content you’ve already written gets pushed down and lost. Sure, SEO can give older content some life, but there’s no reason that old content can’t continue to act like new content, bringing you more readers and social shares. 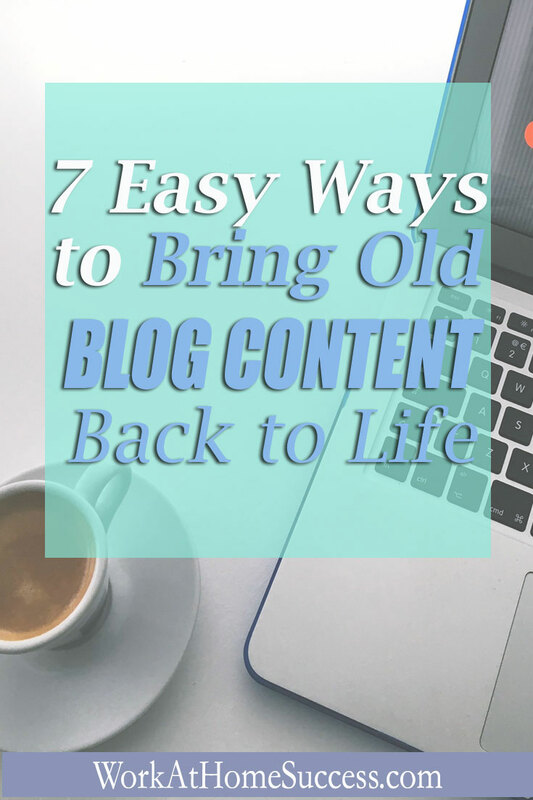 Here are 7 ways to bring old blog content back to life. One way to revitalize old content is to update it with current information, trends, and stats. For example, if you wrote an article on 10 tools related to your topic, and since then one tool is gone, and two new tools have popped up, you can update your article to reflect the change. WordPress users can easy add and update SEO information using a plugin. I currently use Greg’s High Performance SEO for all my blogs, but there are others. (You can find SEO plugins through your WP dashboard under “Plugins.”) The advantage of a plugin is that you can have one title that attracts readers, but another SEO title that makes it easy for Google to rank your page. For example, “Top 10 Books Writers Need to Read to Make $50K a Year,” is reader-friendly…what writer wouldn’t like to make $50k a year? But a better SEO title might be, “Books for Freelance Writers” because that’s the more likely term people would use to search for freelance writing books. The plugin allows you to use both title, one for readers and one for search engines. There are two ways to use related posts. The first is to simply add a list of further reading to your current blog post. For example, here at Work-At-Home Success, whenever I do a list of work-at-home resources, I make a list with links to other similar lists I’ve done. The second way is to use a plugin that lists posts using similar keywords at the end of you new posts. If you scroll to the end of this post, you”ll see a series of related posts generated through a plugin. The advantage of related posts is that if readers liked what they read and want to know more, the links to related posts directs them to what they want quickly and easily. This is similar to related posts in that you’re providing information about past posts. It’s slightly different in that you’re using the past post as a reference for more information. For example, in the paragraph about SEO, I included a link to a past post that explains SEO. In-content linking gives readers more resources to understand the content, but also, search engines use content links to help it rank your pages. If you’ve been blogging for awhile, you have lots of related content that you can organize into a single blog post. This is basically content curation, only you’re just using your content. Or you can do a mix of your and other blogs” content. The easy way to do this is to choose one of your blog topic categories and then create a post with a list of posts organized around a new sub-topic. Many of WAHS articles that are X number of ways to work at home, include links to other content so readers can quickly and easily fined related information. While all social media is potentially helpful, I’ve found Pinterest to be the biggest driver of traffic, behind search engines, to all my sites. Learning how to use Pinterest is a blog post on it own, but the basics are to create a vertical graphic with your blog post title and blog URL, add it to your post, and pin it to Pinterest. Find group boards related to your blog topic through a resource like Pingroupie, and ask if you can post there as well. After a few months, you might consider changing your pin graphic to add new life or see if it performs better. You can find free and low cost graphics, or use a resource such as Canva or Picmonkey to make your pins. A great way to give new life to old content is to present it in a different format. For example, you can create an infographic or video to go along with your old post. This not only adds interest to the old post, but also, more ways to increase traffic, because infographics are great for social sharing and you can have your video on YouTube (over a billion users!). Blogging is a lot of work, but there’s no reason that your old content can’t still do some of the heavy lifting. The seven options above provide you with ways you can make past posts continue to attract new and returning traffic to your blog. ‹ 15 Work At Home Online Moderator Jobs › Work-at-Home Success: How Nathan Mizrachi Took Control Over His Life and Started Working On His Own Terms!